A labeled look at NASA's Mars Phoenix Lander. Severalcrucial devices aboard NASA's Mars-bound Phoenix lander have passed in-flighttesting. 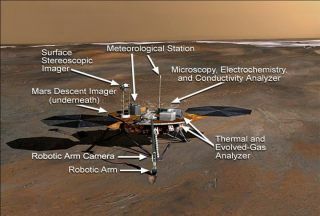 Missionmanagers remotely inspected Phoenix's descent-monitoring radar as well as itsUHF radio, which will communicate with Mars satellites after it reaches the redplanet's surface on May 25, 2008. The instrumentspassed all tests with flying colors as the craft zooms through space at 76,000mph (34 kilometers per second). "Everythingis going as planned. No surprises, but this is one of those times when boringis good," said Barry Goldstein, Phoenix project manager at NASA's JetPropulsion Laboratory, Pasadena, Calif.
Phoenix currently speaks with Earth via ahigh-frequency X-band radio unit, but the device is mounted on a part of thespacecraft that will be jettisoned shortly before Phoenix encounters theMartian atmosphere. The UHF radio will be crucial to relaying data once thepiece is detached. As Phoenixplummets to the red planet's surface, its radar system will ping the distanceto the ground and switch on descent-slowing engines and other equipment at justthe right moments during descent. If thelander touches down in the northernreaches of Mars unscathed, mission scientists are looking forward toprobing the icy soil to check for conditions hospitable to microbial life. Justdays prior to the radar and UHF radio checks, the Thermal and Evolved-GasAnalyzer--which will analyze the soil conditions--also passed thorough checks. Four more instrumentchecks are set before Phoenix makes its correction maneuver,planned for Oct. 16, that will continue the spacecraft on its remaining 422-million-mile(679-million-kilometer) flight to Mars. Phoenix has traversed more 50 millionmiles (81 million kilometers) of space since itblasted off from Cape Canaveral Air Force Station on Aug. 4, 2007.